The Dubya Report was born on December 13, 2000, the day after the Supreme Court awarded the 2000 Presidential Election to George W. Bush. Throughout George the Lesser's miserable eight-year reign, The Dubya Report cast a critical eye over George W. Bush's record, statements and actions, campaigns, his family, roots, contributors, and associates. Although we do offer a selection of choice "Bushisms" and political humor, our real concern is policy. Our focus on issues caught the attention of The Guardian (UK), which included us in their November 2001 list of Bush web sites as among "the best of the bunch." Our articles have also been cited on AlterNet.org, in CounterPunch, Mother Jones magazine, Daily Kos, the Center for Media and Democracy's SourceWatch.org, Wikipedia, Salon.com, and are referenced frequently on the web. We were also cited on air and on the message boards of AirAmericaRadio. From the last days of the 2000 election, continuing through the current administration, there have been repeated calls for "unity" and a tendency to dismiss honest political differences as "partisan bickering." Some went so far as to imply that such disagreements were unpatriotic. In the spirit of the "loyal opposition," found in the Canadian system of government, among others, we asserted our patriotic duty to dissent when the policies and actions of our political leaders were inconsistent with what we believed to be the authentic principles of democracy, or the public good. Moreover, we believed George W. Bush was singularly unqualified for political office. As Molly Ivins put it in her political biography, Shrub, "The political career of W. Bush is a fairly funny yarn, on account of being the son of a former president is not ... how to put this ... not actually sufficient job training for the government of a large state." One might add "much less a nation." Bush's unique lack of qualifications are documented in the Ethics section. Since its inception, The Dubya Report has not wanted for raw material, because the Bush administration, rather than charting the moderate course promoted during the campaign, instead effected a right-wing coup that seemed bent on rolling back every progressive initiative implemented by the federal government since the New Deal. That spirit survives in the wholly owned subsidiary of the Republican party calling itself the "tea party." With advent of the Barack Obama administration The Dubya Report will continue to chronicle the disastrous aftermath of Bush's administration and his Republican minions. We'll also examine how conservative ideologies contributed to the current economic and foreign policy crises, and monitor their now seemingly quixotic quest to create a "permanent majority." 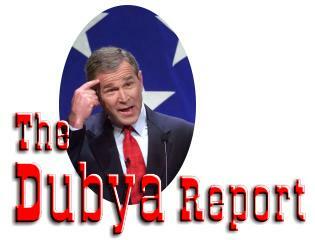 The Dubya Report is a noncommercial site. We receive no compensation from the external sites listed in the Action section on the home page. Site hosting has been donated by our service provider. Through affiliate programs we do receive a percentage of purchases made using links to Amazon.com and VeriSign, and we participate in the Google Adsense program. We also accept donations. The Dubya Report does not collect or store your personal information. If you email us a comment or question we may keep your email address (and name, if provided) on file for future correspondence. You can always opt out of future correspondence by sending us an email message with "unsubscribe" in the subject or at the top of the message body.